Q. Does Alconox or Liquinox contain 1,4-Dioxane? A. Nonionic Liquinox® Critical Cleaning Liquid Detergent likely contains extremely trace levels 1,4-Dioxane, but anionic Alconox® Powdered Precision Cleaner is very unlikely to contain 1-4 dioxane. Sometimes people inadvertently refer to Liquinox as Alconox because it is made by Alconox, inc.
Liquinox cleaner is a nonionic detergent and does contain extreme trace levels of 1,4-Dioxane. In general most detergents with nonionic surfactant ingredients will have trace 1,4 Dioxane as a trace impurity from the ethylene oxide condensed polymers that are part of most nonionic surfactants. 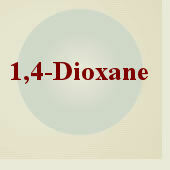 The trace contaminant 1,4-Dioxane is found in nonionic detergents. Most nonionic surfactants are derived from alkyl groups with condensed polymers of ethylene oxide attached. The ethylene oxide polymerization process during the manufacture of the nonionic surfactant results in traces of 1,4-Dioxane being formed. The trace contaminant 1-4 dioxane is volatile. The concentration will diminish with time. In Liquinox detergent the concentration would be well below tens or hundreds of ug/L. The residue potential in a detergent used at a 1% dilution that is thoroughly rinsed would be well below single digit nanograms/L in sampling equipment; very thorough rinsing can reduce that to tenths or hundredths of nanograms/L. Rinsing can reduce trace detectable residues down many orders of magnitude. Labs should do equipment blanks to assure that thorough rinsing has been done whenever any nonionic detergent such as Liquinox cleaner is used.